To be able to use this menu item you need to have an administrator account and be logged into CCalendar as administrator. What is an Appointment Group? Navigate to the menu item "Appointment Groups" in the Administrator Menu. In case there have already been created appointment groups you will see a dialogue with an overview of the already created appointment groups. In case there have not been created any appointment groups, you will only see the empy input mask. Just fill the data into the designated fields and confirm your input with the button "Enter". 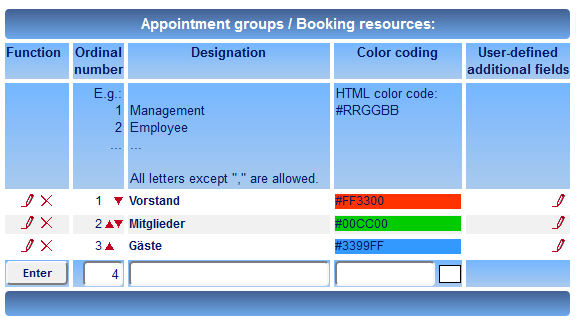 Identification colour Optionally you can assign a colour to every appointment group for better differentiation. All appointments of this group will then be indicated with this colour. You can freely pick this colour yourself. Please consider to avoid very similar colours for he single appointment groups. You can pick the identification colour through a click on a colour in the colour picker or simply enter a colour in hexadecimal format #RRGGBB. (RR stands for the red portion, GG for the green portion, BB for the blue portion - each time a to digit hexadecimal number between 00 and FF). User-defined additional fields: Hereby you can define for all appointments of this appointment-group arbitrary numbers of self-defined fields (like "protocol" / "service" / ...), which are relevant for this appointment-group. Furthermore you can define for this fields, if they will be displayed only internal or public. Confirm your input of the new appointment group entry with a click on the button "Enter". After successful entry the new appointment group is shown in the list. 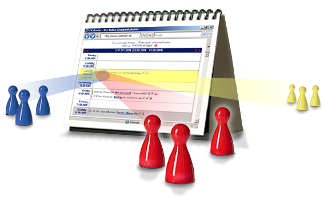 With a click on the edit- or delete-symbol you an change or delete an appointment group anytime. You can edit every created appoinment group by clicking on the edit-symbol (pencil-symbol), that is changeing the identure number, description or identification colour. A change has no influence n the calendar functionality. All associated appointments, of course, remain. - even when you change the name (description) of the appointment group. Confirm your change each with a click on the button "Edit". If successful you see the modification in the list. You can delete each one of your created appointment groups. A security query protects ou from accidental deletion of an appointment group. If the deletion is wanted, confirm the security query with "Yes". CAUTION: With deletion of an appointment group all assignments of an appointment to this appointment group are lost! - The appointment itself remains in CCalendar. It can still be used within under appointment groups. "Our church uses it intensely since last summer and it became our all-in-one calendar. Also the versatile Outlook gateway is gladly used by a lot, also soon the publishing function on our church website. So all in all VERY GOOD!"